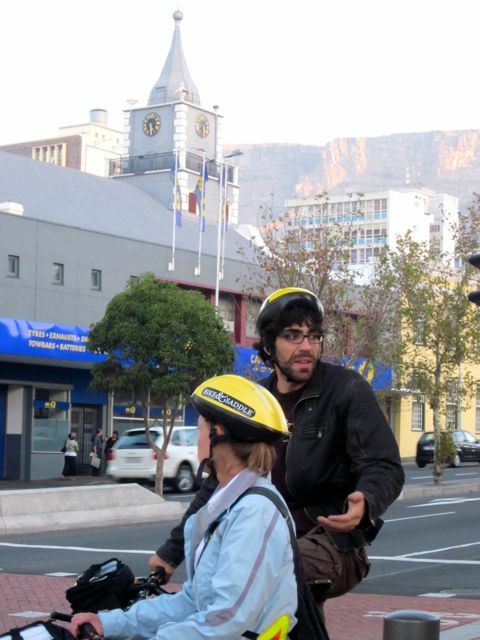 Savour the sights and sounds of Cape Town from the back of your trusty bike, with a guide behind you every pedal of the way! It’s fun, healthy and active – and what’s more it’s good for the environment. Leave the historic V&A Waterfront from the five-star Cape Grace Hotel as evening descends on the city. Follow Beach Road as waves lap up on the shore, with theiconic Cape Town World Cup Stadium beside you. Idle through the Company Gardens, home to Parliament, the National Gallery and much more! 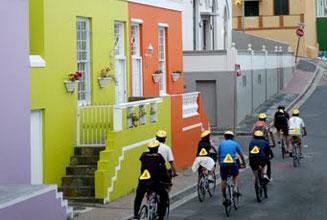 Soak up the bars and cafes on Long Street before the smell of Malay curry fills the air in Bo-Kaap with its mosques and coloured houses. Return to the exclusive Waterfront Marina Yacht Basin for a glass of sparkling wine and gourmet canapes at the famous Bascule Bar as the sun sinks below Table Mountain! It’s a great Eco-Active adventure – so what are you waiting for? 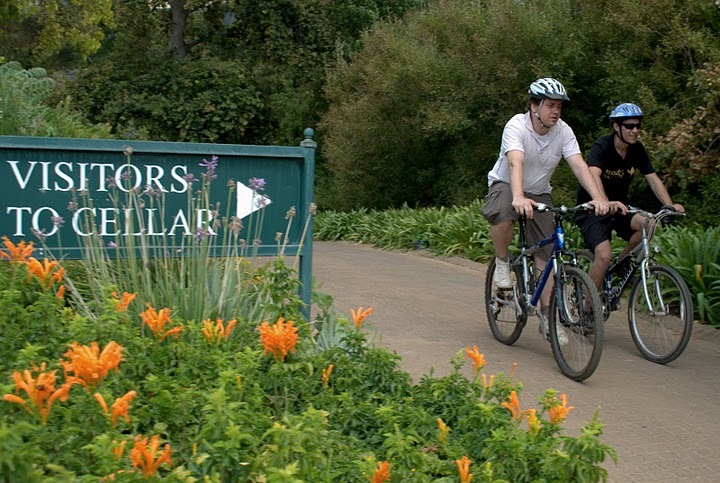 Half or Full Day Cycle in the Constantia Wine Region. Step back in time and trace the history of viniculture in South Africa by visting the country’s foremost wine estates in the lush Constantia valley. 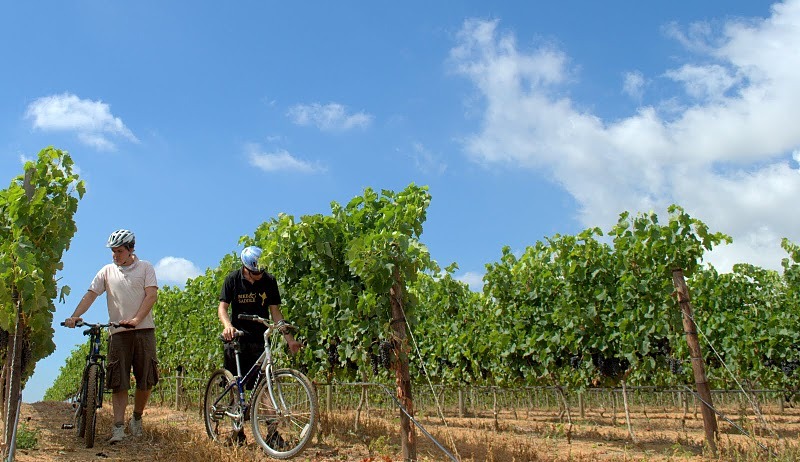 Meander through the rolling vineyards on your bicycle, learning first hand about the various vintages, all the while framed by the brooding backdrop of the mighty Table Mountain. Constantia is one of Cape Town’s most sought after suburbs and was initially a private estate occuppied by none other than Simon van der Stel, governor of the Cape Colony, in the late 17th century. Wine production began here as early as 1685, shortly after the Dutch occupation of the Cape, and it was not long before these wines became the envy of the world, being coveted far and wide. Originally one mammothestate, this farmland was divided after van der Stel’s death in 1712 and is now home to seven producers, each one unique but sharing the same commitment to preserving the fine wines and rich heritage of their predecessors. testament to the heritage of this region, with a private cellar tour and tasting by special arrangement. We cycle through the vineyards themselves, with panoramic views over the valley and False Bay where the Atlantic Ocean hits sunkissed beaches. A number of renowned estates are included, with the chance to meet the sommelier and sample some of the best wines this country has produced, including the notable Vin de Constance, which was personally requested by none other than Napoleon Bonaparte! hod cap classique, enjoyed in the most scenic of locations. NB: This tour can be done as a morning/afternoon excursion, but we recommend the full-day outing to really experience the history and heritage of the region, the fine wine and gourmet cuisine. We will meet at the Cape Grace Hotel at the V&A Waterfront where we will take our shuttle bus for the 45-minute trip to Paarl. We arrive at Grande Roche Hotel, located within a vineyard below the majestic Paarl Rock. We gather here for a safety briefing where our guide explains the cycle excursion. We set off on our mountain bikes, down onto the main road, past a number of charming cafes and quaint guesthouses with the vineyards rolling down the slopes to greet us! We make our way off the tarred road and onto Jan Phillips Mountain Drive, which leads us into the pristine Paarl Mountain and Nature Reserve, with the jagged peaks of the Paardeberg mountains glistening in the distance. 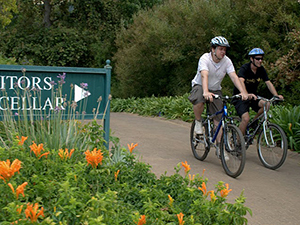 We cycle through this shaded sanctuary, making our way up towards the mighty Paarl Rock. Paarl means Pearl in Afrikaans and it is from this massive rock that the town got its name as it glistens like a pearl in the early evening. We climb up the hill, our only real climb of the day and are rewarded with magnificent views of the valley below as we near the Taal Monument, a tribute to the Afrikaans language. We ease our way downhill back onto tarred road, and join the Suid-Agter Paarl Road which brings us to Fairview Cheese and Wine Estate. Fairview is a world-famous estate and the perfect place to sample their selection of cheeses (brie, camembert and goat’s cheese to name but a few) and award winning wines. We relax here, stretch our legs and refill our stomachs! We continue on a tractor trail, meandering through lush vineyards with unparalleled views before us – Table Mountain is visible on a clear day, with farms spreading out across the deep blue horizon. This wonderful trail connects Fairview with Seidelberg Wine Estate, with over 300 years of rich winemaking tradition. Seidelberg boasts an impressive collection of vintages and must command one of the best vistas of any vineyard, anywhere in the world! We try some of their best wines, or grape juice if you prefer, while indulging in a gourmet lunch! Finally the guest will have some time to relax before taking the shuttle back to Cape Town. Please send us some feedback on this page if you book and enjoy one of their cycles! I loved the city tour option – I am however a real once off cyclist! !